Educated Cheese: The Jets are funny. I absolutely despise the Jets. Almost on a Yankee-level. And its not an easy 'hate' because they are one of the most sorry franchises in professional sport. Anyways, anybody who knows me knows that I also like making celebrity look-alike comparisons. But the one pictured above isn't a look-alike. 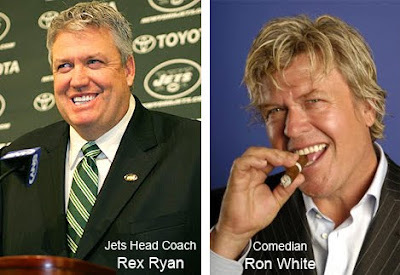 The Jets were fooled... they actually did hire comedian Ron 'tater-salad' White to coach their football team. So while Jets fans will expect a team ready to conquer the Pats today, they'll get nothing more than wisecrack jokes about toilets and scotch whisky. Sox won. Yankees won. Rangers won. For those of you who still have playoff doubts or goals set on the division, you may want to run your eyes across this before you start betting the family's nest egg. Sox odds: 4.6% to win the division, 95.2% for the wild card, 99.8% to make it to the playoffs. Time to dust off the count-down board, people. We're into single digits, the magic number is 9.